I know, you thought I was gonna say ice cream. 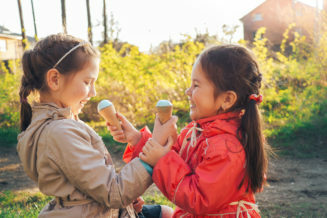 Connection is even more important than ice cream, which some of you may argue. As humans, we are wired to thrive when we interact with our world. The most obvious goal of marketing is to create awareness and leads. The only way to do this is to really connect with people. Simply spitting out sale prices usually doesn’t do the trick, because although some people love a bargain, most want connection and customer truly like them back. Telling your story to the people who matter (aka your ideal client persona) is a foundational marketing component. Creating opportunities for two-way conversations, whether through social media or one-on-one conversations, creates connections. Happy customers even form connections with other happy customers, and voilà, a community is born! A community of loyal, connected clients will support you through thick and thin, through new endeavors, and slow times. Connected followers can be fans for a short period of time or for life, but they matter deeply to your organization. What processes do you have in place to connect with people? Having an authentic and relevant message and putting it in the path of your ideal clients on a consistent basis works over time. And we’re in it for the long haul, aren’t we?